Property located in Povoa de Varzim just 10 km from the city center, in a quiet location with magnificent beaches. 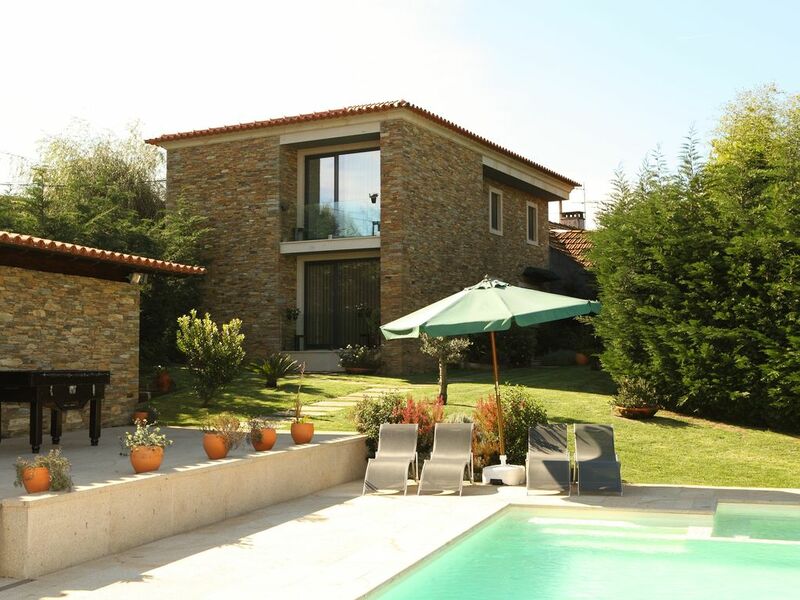 The house consists in four double bedrooms, four bathrooms, dining / living room and fully equipped kitchen. It offers internet and private parking. It has central heating and private parking. This property has the possibility to host more people in additional beds. It offers a catering service for 15 euros person / meal (on request). Outside you will find a beautiful garden, private saltwater pool, playground, multi-purpose sports field (volleyball / badminton / soccer / handball), football table, barbecue area, garden furniture and nine bicycles at disposal. If you&#39;re staying at this property you will be surprised on arrival, with a homemade snack with regional quality products offered by the owners. Nearby there are restaurants (1 km), supermarkets (1km), Estela golf course (11km) the casino, nightlife and bars within 10km. The place is conducive to outdoor activities such as water sports, golf and cycling. Oliveiras, at Rates, Povoa de Varzim will have a fantastic time as we all did. Top marks for The owners Carlos and family. From Chamberlain, Harding and Dobson families, Kent, UK. Dear Carlos,Many thanks for nice days we spent in your vila. Yes, we are saftely back home after a nice trip in Portugal. Thank you very much for extremely warm hospitality, your help and of course your nice and confortable house.With best regardsIlona. Nous garderons un bon souvenir de notre séjour à Povoa de Varzim. Des amis du Haut de France "59- 62"
La maison est magnifique et tout est fait pour qu'on sente bien. Les propriétaires sont adorables et plein de petites attentions.